On this page we are going to go through the shaving soaps we have looked at in our review site, and give you a break down on each of the products and look at the main points. We are going to put a link at the bottom of each of the shaving soap articlels so that you can go straight through to Amazon.com. You get some more information and look at customer reviews, and then be able to purchase the products you are interested in. I personally have bought a couple at a time and switch off based on the mood I’m in or the smell I want to end up with from using the soap. Shaving soap goes hand in hand with a quality shaving brush and safety razor. Shaving brushes are all very affordable and you can start with our list below to find one that you would like to try. Enjoy! Large 3.8 OZ Shaving Soap Refill Puck For Sensitive Skin. All Natural Ingredients. Includes 5 Derby Double Edge Razor Blades. Made in USA, Himalaya. 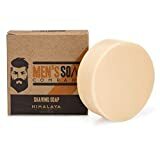 This shaving soap is a good product for people who want a close and comfortable shave without being left with an irritation or rash after shaving. You want a soap that is suitable for use on sensitive skin. This product contains quality, all natural vegetable based ingredients to comfort and sooth the skin. By using a good shaving brush with the soap, it will produce a dense thick lather quickly. The razor will move over the skin smoothly and get a closer shave while protecting and leaving the skin moisturized without razor burns or irritation. Proaso shaving products originate from Italy have been keeping men well- groomed with their shaving products for many years, and this shaving soap is suitable for sensitive skins, so that you are able to get the closest shave without irritation as it doesn’t contain any harsh ingredients, or any artificial colors or mineral oils, which can clog the skin. Proraso Shave Soap, Sensitive protects and soothes the skin while shaving and contains oatmeal and green tea which will protect inflamed, sensitive skin, making it possible to shave every day without resulting in rashes or bumps. The shaving soap has a nice fresh smell that isn’t overpowering, and gives a thin lather to make shaving as comfortable and close as possible. Read our full shaving soap review here. You will not see the soap form a really think lather like you would in other soaps. I found that all of the proraso soaps are like this. Not a big deal whatsoever but I know some men just prefer a think lather just because that is their preference. To buy Proraso Shave Soap, Sensitive from Amazon.com click here. With just a small amount of shaving soap, it will give you a really creamy and luxurious lather to make your shave more comfortable and effective, even when using on sensitive skin. It will allow your razor to just glide over the skin without pulling and dragging which causes irritation. 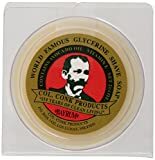 Col. Conk Worlds Famous Shaving Soap, Bay Rum has a unique smell which is very nice, and is made with ingredients such as Avocado Oil and Vitamin E which are natural and gentle and help soothe as well as protect the skin. It is pleasant to use and moisturizes the skin, with ingredients such as Avocado Oil and Vitamin E which are natural and won’t cause irritation, while allowing a close shave without razor burn or rashes, producing plenty of lather to repeat the shave if necessary. To buy Col. Conk Shaving Soap, Bay Rum click here to take you to Amazon.com. Proraso New Shaving Soap Pot Sandalwood is made with high quality ingredients to allow a close shave, as well as being gentle and moisturizing to the skin so that it leaves the skin conditioned and without irritation. The shaving soap produces a thick and dense lather, quickly, and easily, feeling comfortable on the skin, so that the razor can glide over the skin without any dragging. The lather stays on the skin without dripping, and there is plenty of lather left on the brush for an entire shave. Proraso New Shaving Soap Pot Sandalwood doesn’t contain alcohol, parabens, silicone, or mineral oils, and is enriched with shea butter, sandalwood and glycerin. The soap will prepare and soften the skin before you shave so that you get a very good shave. Even if your beard is coarse or thick, it will leave the skin soothed and without any rash or burns. This shaving soap gives a very nice refreshing and cooling experience while shaving with the invigorating eucalyptus and menthol, which also soothes the skin during and after shaving. It contains other good quality ingredients which are kind to the skin. The dense lather produced from the soap ensures a really close shave, without nicks or razor burn and will stay on the face without dripping or sliding off. The razor will just glide over the skin and feel comfortable, while still shaving as close as possible. The lather from the soap lubricates the blade really well, and it doesn’t leave any residue on your razor or your face which some shaving products do. It all rinses away easily, and won’t clog your razor, and leaves the skin feeling fresh, cool and moisturized. Read the Full Review Here. To buy Proraso Eucalyptus & Menthol click here get it discounted from Amazon.com. Luckily shaving soaps are cheap and you can try different brands without braking the bank until you find the perfect one. Honestly, you really can’t go wrong with any of them. What will happen is that as you use a safety razor to shave you will start to get a bit particular about what type of brush you use and how it lathers the soap. Then you will get picky about the thickness of the lather of the soap and smell of it. It starts to turn into a hobby after a while and you just start trying new soaps all the time. What I love about this style of shaving soap is that they last for months! It’s so much more affordable than buying shaving cream.